PWC is your Culpeper delivery point for The Fresh Harvest! The new year brings a new pool filter, new local partnership, new fitness equipment and new shakes to fuel your workout and support your healthy lifestyle! Looking to improve your overall fitness level for a more successful riding experience? 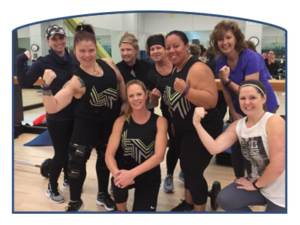 This small group training program beginning on February 5 with PWC personal trainer and equestrian Amy Biddle will set you up for success in the saddle. Are your taste buds ready for a happy dance? Try one of the smoothies of the month or another tasty selection at the café! You can even order your shake prior to your workout so that it will be ready when you are finished. Enroll in swim lessons this winter to be ready for next summer’s swimming fun! PWC will offer the following classes in its indoor warm water pool: Parent & Child (ages 6 months – 3 years), Preschool Aquatics (ages 3-5 years), Learn to Swim (ages 6 – 13 years) and Adult Swim (ages 14 and older). We’re celebrating the holidays with special health and wellness gifts for you! With the temperature dipping into the low 30s and the wind chill making the feel-like temperature in the teens, this was no normal Thanksgiving morning. Runners lined up outside of Powell Wellness Center to participate in the inaugural Culpeper Turkey Trot.